Dubai, UAE, October 15, 2018: kate spade is inviting you to saddle up for fall 2018. Get ready for some wild, wild west to invade your wardrobe, with kate spade's beautiful collection of fringes and tassels, horse-inspo and gorgeous embellishments. From gorgeous dresses, and fringed jackets to keep the cowboy theme real and OG, to fringed sam bags, kate spade will surely make you say Yee-Haw! Horse-inspo and tassels don't end at garment fashion with kate spade has a gorgeous pair of bedazzling Horse Statement earrings and horse Pave Horseshoe rings. 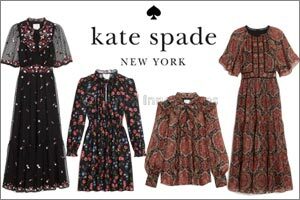 If you are looking for something more girly and frilly, kate spade has an ultra-feminine dress that is bound to make you feel like a flower amongst thorns.